What if we made a big, sweeping gesture? A spectacle? What if we took purposeful control, for one year? What if we agreed that each of our theatres have guiding principles that lead us to feature certain styles and genres of theatre, generated by artists of certain identities? What if we agreed that these guiding principles are both conscious and unconscious? What if we, without judgement, each examined our theatre’s dominant framework? What if we, still without judgement, noticed whose voices, perspectives, and stories are typically centered at our own theatre, and whose are on the margin or absent? Here’s examples of identities that might be present in intersecting ways on your theatre’s stages: artists of color, Native American and Indigenous and First Nations artists, women, non-binary and gender non-conforming artists, LGBTQIA2+ artists, Deaf artists, and artists with disabilities. What if we, the theatre community of the United States of America, identified our individual growing edges—the place of unknown and discomfort, where our desire for change engages the full range of our current capacity? What if the varied, complex narratives of all people in the US filled the stages of our theatres? What if we embraced this as joyful responsibility? What if we positioned this as an opportunity and celebration? What if we called it the JUBILEE? Over a year earlier, The Committee for the JUBILEE had begun meeting by phone and Skype. An initial group, enabled by Kirk Lynn, came up with this vision to address parity in the American theatre: creating a pledge for companies nationwide, that commits them to produce a season (2020/2021) of traditionally marginalized artists. The Committee shared this vision widely and invited everyone to join their regularly planning meetings. Committee meetings were often chaotic and usually fun. But we came together around a central belief: theatre in the United States can do better. When HowlRound released the Challenge RFP, a trio of Committee members answered by proposing the first face-to-face meeting of the Committee for the JUBILEE. We proposed using the convening to plan and shape this festival, to give our committee some structure—dividing into working groups around marketing, recruitment, fund-raising, producing, etc. The JUBILEE has always been a dynamic organization. Since inception, different members have been available to meet and plan at different points. We view this dynamism as a strength. Theatre in the United States too often places value and centers power in static receptacles: buildings, individual “visionaries,” large bureaucratic organizations that resist speedy change. Static power can even calcify; it can become an anchor that keep the industry from moving forward. We understand this is a result, a contemporary expression of our regional theatre movement roots. But our yesterdays do not need to define our tomorrows. Our proposal to convene the Committee for the JUBILEE was accepted by HowlRound. We started the work of filling in the list of attendees. At that time there were over eighty members of the Committee, and only fifteen people could attend the convening. We knew the convening attendees would form the first year “core producers”; that we would ask for some heavy lifting. The full Committee, who had been updated and included through the application process, were invited to apply. Individuals who pledged to support the JUBILEE in 2020/2021 were invited. The application was public. 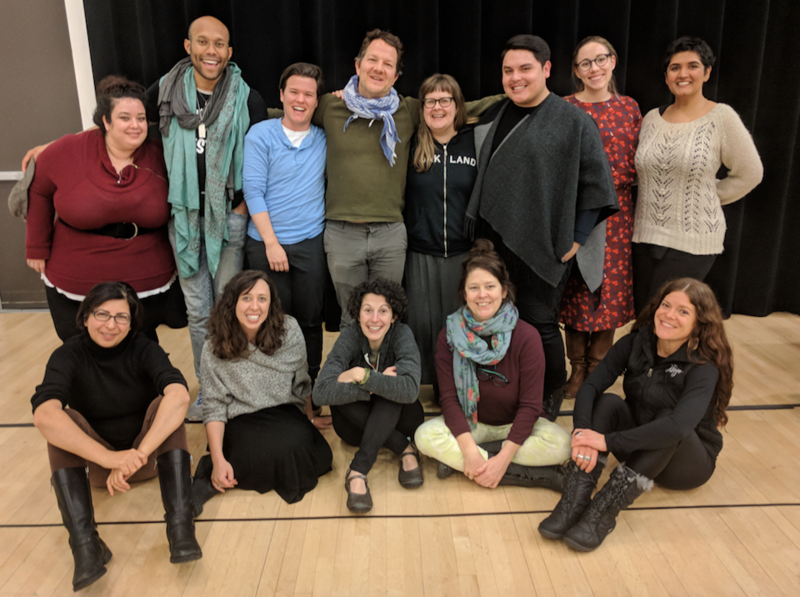 In addition, the JUBILEE “executive producers” (Kirk Lynn, Rachel Grossman, Aditi Brennan Kapil)—with the assistance of HowlRound—attempted to recruit those who were reflective of the JUBILEE’s mission and could form a wide, intersectional producing network. We sought a group of convening attendees that would reflect the full constituency of theatre in the US. The turnaround time was short from application acceptance to convening occurrence. We asked a lot from potential attendees. There were gaps. This is the list of attendees to the HowlRound Challenge Convening of the Committee for the JUBILEE: Aditi Brennan Kapil, Alex Meda, Courtney Sale, Erica Nagle, Erin Washington, Isaac Gomez, Jamie Gahlon, Jonathan McCrory, Joy Meads, Kirk Lynn, Lavina Jadhwani, Lisa Channer, Mary Kathryn Nagle, Rachel Grossman, Regan Linton, and Will Davis. Our time in Boston was productive and celebratory, but also complicated and fraught. We labored: administrative, creative, emotional. We were proud of the more than sixty theatres we had recruited to that point. We were disappointed at the lack of larger institutions. We recognized there was more we could do to make the JUBILEE more inclusive and welcoming to all. The most difficult conversations at the convening revolved around notions of 100 percent compliance. Who would be “in” and who would be “out.” A turning point, or a paradigm shift, came when Jonathan McCrory articulated the JUBILEE as an ongoing process, an investigation that could be entered into again and again. One could not really become “JUBILEE compliant” (whatever that would mean) and then call it a day. Isaac Gomez complimented this by offering to us the concept of “the growing edge.” We began to simplify the vision for the JUBILEE: an invitation for all theatres to examine what their dominant frameworks are and what voices, stories, and perspective aren’t typically a central point of focus for them. What if after 2020/2021 we discovered that giving voices to marginalized communities rejuvenated theatre in the US? Just because a theatre produces only queer artists, their growth doesn’t have to be over. They could move to their growing edge and ask, What artists or stories aren’t we producing? An example might be queer artists with disabilities. A women’s playwright collective might attempt a devised piece with a non-binary artist of color helming the process. A predominantly white regional theatre might produce only plays written by women and/or playwrights of color, and hire two Deaf artists during the season. The possibilities go on and on. Immediately, the JUBILEE became more adaptive and flexible. It was ironic that a face to face meeting maybe freed our most adaptive and dynamic selves, doing the same to the JUBILEE’s vision. And now, the JUBILEE has officially “re-launched.” You can now sign the JUBILEE pledge as written, or you can write our own JUBILEE pledge, stating what the JUBILEE means to you and how your organization will engage with it in 2020/2021. As always, we invite you to join us. Whether you are immediately supportive, if you have caveat, or you are critical: please reach out. Join a phone call. Engage with us. We invite your participation in the JUBILEE. Because what if our country, as it exists now, was represented on the stages of US theatres for one year? What if it made a difference? What if after 2020/2021 our growing edges expanded, the current edge became attainable, and a new edge emerged? What if after 2020/2021 our tolerance for status quo decreased and for change increased? What if after 2020/2021 the stories we see on our stages reflect the world in which we live and the country in which we inhabit a little bit more every year following? What if the JUBILEE was an explosive catalyst? What if the JUBILEE was only a moment? We’ll never know if we don’t try. But we do know that what we’re doing right now isn’t working. We all have a current dominant framework. We all have voices, perspectives, and stories that are traditionally marginal within that current dominant framework. We all have a growing edge. Now is the time for unity. Now is the time for action. For one year—the 2020/2021 season—we invite everyone to join us. What you're suggesting violates liberal principle and federal law, so I'm fairly certain this is the wrong path. Hi SJ! Thanks for engaging in conversation around the JUBILEE's relaunch. How do we move towards greater equity and inclusion in U.S. theatre? In some communities, this is a big thorny question with which to wrestle. In others, it's a question urgent to peoples very survival. And there's a range of experiences inbetween. As a result, there are numerous efforts occurring in theatres, with service organizations, and even between groups of individuals to address this question through action. The JUBILEE is one such effort: it is a movement that invites institutions and individuals to face the question, self-reflect, and then plan a single season. Everyone isn't going to accept our invitation, we know that. That's ok because an invitation isn't an expectation and there are all those other efforts. I, along with my JUBILEE colleagues, are warmed to learn that you too want to hear unheard voices. I look forward to learning what efforts you discover and join. Thank you once again and have a great end to your week! Playwrights are produced because of relationships. Why not have a Jubilee that, say, instead of having theatres pledge to discriminate based on race, suggested they produce previously unproduced playwrights, regardless of race? Why not ask them to pledge to produce new work by new writers? This doesn't guarantee inclusion and diversity, but it's also not a race/gender/sexuality based system of producing artists. Which is a plus. You want theatres to sign a pledge to make artists' race, gender, and sexuality the deciding factors in whether or not they will be produced. You want them to pledge to only produce certain races. Certain genders. Certain sexual orientations. You want to make artistic decisions for an entire year based on immutable characteristics of the artists. This is what you are calling for. A chill just ran down my liberal spine. This is not progress. This is moving us to a race/gender/sexuality based quota system. You won't use the word quota, because you know the concept is unthinkable to a liberal mind, but you are openly saying that equality of opportunity does not work. You are calling for equality of outcome based on characteristics no one chooses and no one can change. You're not calling for a certain percentage. You want all creative decisions to be race based. This has gone too far. It is illiberal. I will flat out say it: This is wrong. To define artists by these characteristics is something the left fought against for decades. If there are any liberals left out there who do not want artists to be defined by these metrics, please let me know. I want theaters to produce the best work available. I think too much of that best work is passed over because of immutable characteristics. Statistics show year after year that my industry is biased (https://www.dramatistsguild.com/advocacy/the-count-2/). By the framing of your post I think we stand together on a whole mess of topics. I would love to stand with you on this. I want a nationwide theatre festival celebrating unheard and underheard artists. But we can also disagree and still both be liberal. I appreciate your great passion. I'm sorry, but these stats do not show bias. They can't. They only show disparate outcomes. Correlation does not prove causation. This needs to be said because this data has been cited to prove discrimination for years, In Intro to Stats courses they tell you that you can not claim this as proof of anything other than disparity. We have to stop telling people this proves bias and discrimination. It doesn't. It suggests bias, but we'd have to run an experiment to prove it. And we've run the experiments. We have altered season programming and festival rules and done everything we can think of operating under the hypothesis that this disparity is caused by bias. Nothing has changed. I want to hear unheard voices, but we cannot discriminate to do so. It morally unacceptable on its face. And it's a bad idea. We cannot continue to break people down by these characteristics. It always, always, always leads to conflict. Always. We are watching a new form of tribalism emerging from the left, and I cannot stand with it. In fact, its not emerging, it's here. It's not going too well, is it? There will be problems. I guarantee there will be conflict over who qualifies and who doesn't, based on identities. Hell, if any of the theatres who pledge receive federal funds, they will be breaking the law by discriminating based on race, gender, and sexuality. As I said before, this is wrong. One would have to decide that discrimination is acceptable in certain circumstances, which means our principles are not actually principles. And the real world, on-the-ground consequences are here and they are driving people toward conflict.